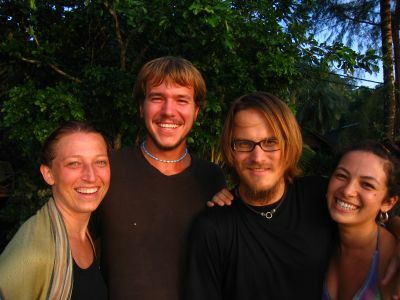 on the way to an island off the coast of malaysia, palau tioman, i got separated from anna, yume, and zac. when i got off the boat they greeted me, unexpectedly, while holding this sign they made. "welcome michelle kvasta." one of my favorite moments on the entire trip. anna combs the freshwater stream that runs to the ocean for souvenirs on palau tioman. anna is a professional dancer back in sweden. 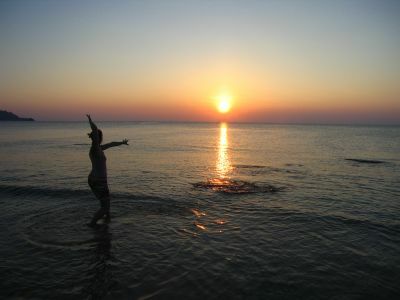 here she shows off her moves in low tide as the sun sets on the island. "now, what exactly am i doing out here? oh yes: having the time of my life!" each night we started a fire on the beach. if you build it, they will come. 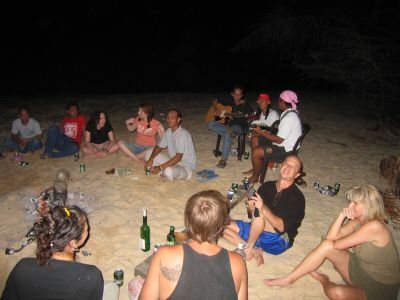 many of the folks staying on the island would swarm down to the fire as some locals played music for us. anna, zac, me, yume. posing for a shot before another night at the campfire. we stayed in some bungalows on the beach. zac and i split a room with a bathroom and two queen-sized beds for $2.50 each. 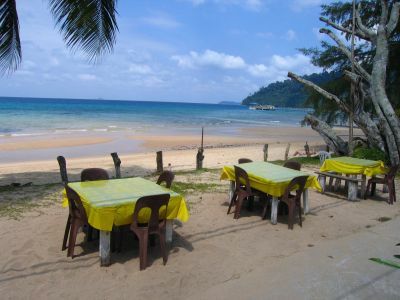 here is the restaurant that you eat at for $1-$3 per meal. 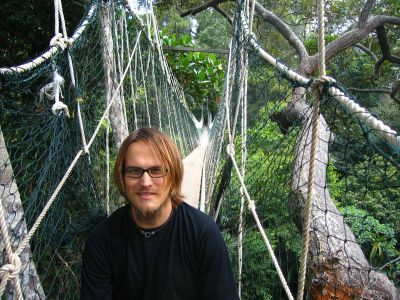 from palau tioman, zac and i headed inland to taman negara, the national park, of malaysia. 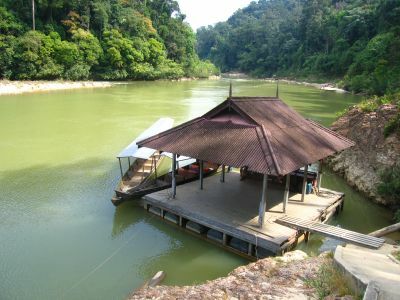 we rode in a long skinny wooden boat to the middle of the 130 million year old jungle and stayed for a few days. 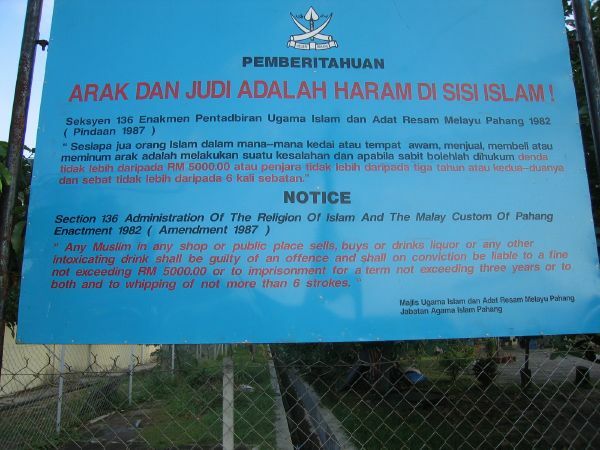 here is the dock in front of the hostel. 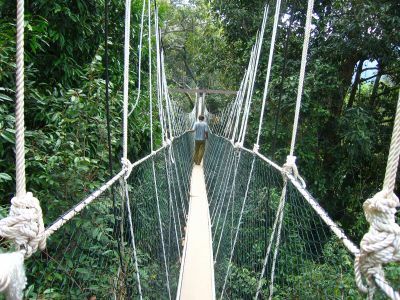 the canopy walk dangles 26 meters (86 feet) above the floor of the jungle. the rickety, ramshackle walk is very narrow and very wobbly. here is zac walking ahead of me. see? i was actually there. we met louisa and hannah from denmark out there in the jungle. 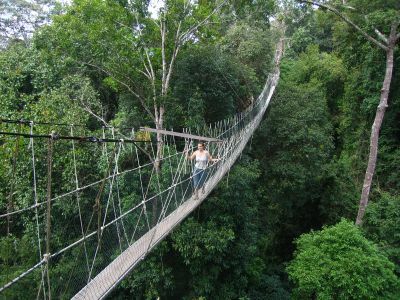 here is louisa walking the canopy. my favorite shot of the day.